1946-12-31 by the Constitution. Modified on 2009-11-16. 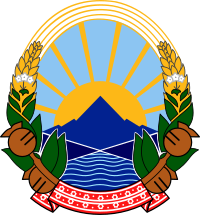 The coat of arms of the Republic of Macedonia is composed of two curved garlands of sheaves of wheat, tobacco leaves and opium poppy fruits, tied by a ribbon decorated with embroidery of traditional Macedonian folk motifs. In the centre of the ovoid frame are depicted a mountain, a lake and a sunrise. These devices are said to represent "the richness of our country, our struggle and our freedom"
Àmì ọ̀pá àṣẹ ilẹ̀ Orílẹ̀-èdè Olómìnira ilẹ̀ Makẹdóníà je ti orile-ede. Àtunṣe ojúewé yi gbẹ̀yìn wáyé ni ọjọ́ 24 Oṣù Kejì 2019, ni ago 05:53.